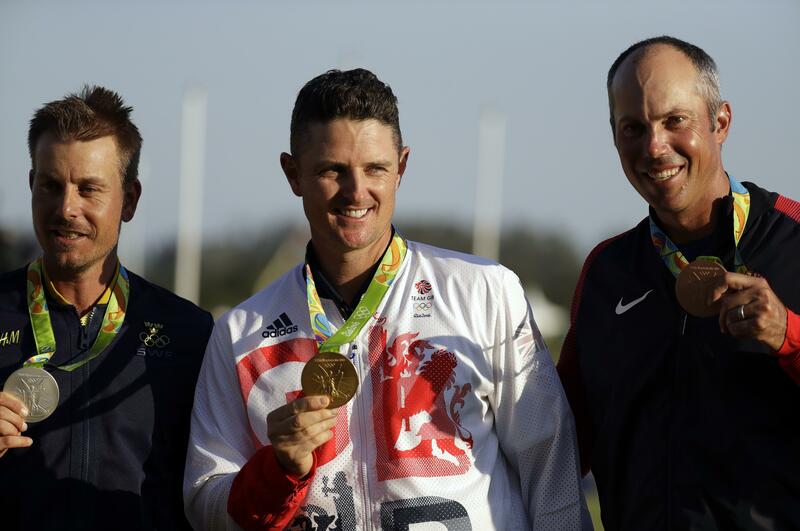 RIO DE JANEIRO – From the top step of the podium, Justin Rose bowed his head as the Olympic gold medal was placed around his neck, and he stared at it for the longest time. The birdie gave him a 4-under 67 and a two-shot victory over Henrik Stenson to win golf’s first gold medal since 1904 in St. Louis. “I’ve never been so happy with a third-place finish in my life,” Kuchar said. Stenson’s pitch from 50 yards came up short, just over 20 feet away, and then Rose delivered what amounted to the winner. Knowing that Rose was in tight for birdie, Stenson rammed his birdie putt some 7 feet by the cup and missed the par putt, giving him a 3-under 68. “He made a birdie and I didn’t, and that’s why he’s got a gold medal and I got a silver,” Stenson said. It’s not nearly as valuable as his silver claret jug from Royal Troon, but still special. “We said that all along in the Olympics, you’ve got some pretty good consolation prizes,” Stenson said. Golf organizations lobbied hard to get the sport back into the Olympics, only for some of the biggest stars – including the top four in the world – to withdraw in the month leading up to the Rio Games for reasons that ranged from fears over the Zika virus to security. Padraig Harrington referred to them as “sheep” for following each other out of Olympics. The 60 players who came, dressed in their country colors and team bags – and three medals at the end of the week – showed what the absentees were missing. “This is one of the greatest golf trips I’ve ever been on,” said Bubba Watson, who had planned to stay in private housing until moving into the Olympic Village on Tuesday because he didn’t want to miss out on the experience. The lasting memory of golf’s return was Rose and Stenson going toe-to-toe for more than five hours before a sellout crowd (capped at 12,000 tickets), neither with more than a one-stroke advantage until it was over. And there was Rose at the end, wildly pumping fists as British fans waved the Union Jack around the 18th green. Published: Aug. 14, 2016, 11:01 p.m.